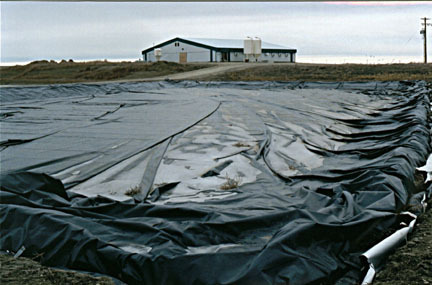 A permeable floating cover can help achieve two goals in the storage of liquid manure; reduction of odors, and reduction of liquid. In certain areas the climate is such that there is significant evaporation from a manure pond. In these areas the typical practice has been to allow evaporation to reduce the volume of liquid in manure containments. This reduces the amount of manure that has to be handled. Unfortunately leaving the pond open to promote evaporation also promotes the production of odors. Layfield provides a permeable floating cover material that covers the surface of the pond to reduce odors, while allowing some evaporation to take place. Permeable covers are made from UV-stable geotextile materials that do not absorb water. These odor control permeable covers are prefabricated into one large piece so that they can be pulled on and off the lagoon for maintenance and for pump-out.